This past Wednesday, 29 August 2012 a CDC press release, Children with Neurological Disorders at High Risk of Death from Flu was issued. LeftBrain/RightBrain was the first I could see who relayed this information on 29 August 2012. In the past couple of days, Disability Scoop, History of Vaccines, Autism Science Foundation and a plethora of news outlets have reported this. The original study can be found in the most recent edition of Pediatrics. Of the 336 children (defined as people younger than 18 years) with information available on underlying medical conditions who were reported to have died from 2009 H1N1 flu-associated causes, 227 had one or more underlying health conditions. One hundred forty-six children (64 percent) had a neurologic disorder such as cerebral palsy, intellectual disability, or epilepsy. Of the children with neurologic disorders for whom information on vaccination status was available, only 21 (23 percent) had received the seasonal influenza vaccine and 2 (3 percent) were fully vaccinated for 2009 H1N1. Emphasis added. Yet not a single word about this study for parents of high risk children, in particular to make an informed choice. Let's take a look at Dr. Joseph Mercola's website, the "alternative practitioner" who actively railed against the potential dangers of H1N1 influenza vaccination and vocally dissuaded his readers from getting the vaccine for themselves and their children no matter what. Nope, not a word there either about this study. 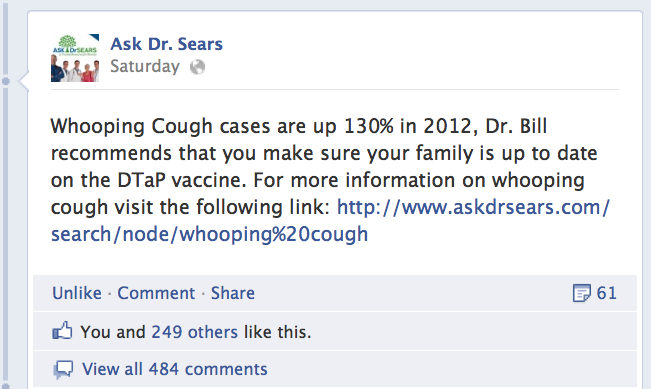 Surely Dr. Bob Sears another proponent of "informed consent" for vaccines has something about this study. He is after all a paediatrician and DAN! doctor who takes care of medically-fragile children. One would think that this is very important information to share with his readers and patients. Sixty-four percent of the H1N1-related deaths in 2009 were among children with cerebral palsy, intellectual disability, or epilepsy and only 3% were fully vaccinated for H1N1. No, complete silence there too. Except of course to register his outrage over California's AB2109 bill which requires informed consent before opting out of vaccines. At least he is consistently against informed consent by not providing his own patients with any. 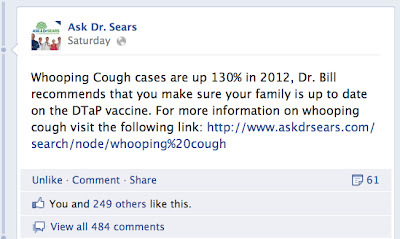 Dr. Sears also shares his extraordinary knowledge of H1N1 vaccines, vaccine testing and his ability to sling conspiracy theories around with the best of them. Another obvious place to look would be Dr. Jay Gordon's website since he is so terribly concerned with vaccines and vaccine-preventable diseases. I would imagine that Dr. Jay also has medically-fragile children in his practice and would want their parents to know about how such underlying conditions can be risk factors for things like complications from flu. No, nothing there either but he is certainly not shy about promoting his interview with Anderson Cooper and letting us know what a particular colour of poop means. Dr. Jay is also against AB2109. Dr. Jay also had some truly brilliant insights regarding H1N1 pathology, vaccination and epidemiology. This CDC press release was embargoed which essentially means that their media contact will pre-release it to certain parties in order for them to prepare a story for when the story is released. It is considered really bad manners to break an embargo. Needless to say, many anti-vaccine/autism groups have really bad manners and think nothing of breaking embargoes when it suits them. One of the most egregious anti-vaccine/autism sites, Age of Autism not only minded the embargo but seems to have extended it by not mentioning a word of it. The only "stories" there were the usual wailing and gnashing of teeth over genetics studies, conspiracy theories and how the IACC won't recommend study directives for vaccinesdidit. This is clearly inconvenient information for those who take every opportunity to denigrate vaccines, lie about the true risks of vaccine-preventable diseases and vaccines or are just too dumb to disseminate factual information regarding vaccines and the diseases they can prevent. The true believers will never be swayed and completely miss the point that there are medically-fragile children who are at a greater risk for disease complications and intentionally withholding this information by so-called autism and vaccine-safety organisations and healthcare practitioners is tantamount to lying. Addendum 9.1.12: Commenter lilady linked to Dr. Jay Gordon's views on H1N1 vaccines and disease shortly after H1N1 began circulating. I added that and Dr. Bob Sears' views as well. Thank you lilady; I now feel stupid for reading those. Little Rock -- The Arkansas Department of Health (ADH) has confirmed that there are laboratory results from the Centers for Disease Control and Prevention (CDC) confirming that at least two of the original three suspected cases of measles in Gentry are positive. According to Gary Wheeler, MD, branch director of the Infectious Disease Branch at ADH, these results were expected, based on the first medical examinations. “The message is very clear -- immunizations are important for protection of the individual. They are also important protection for the community,” Wheeler said. An 18-month-old girl and one-year-old boy died of measles pneumonitis in Darpa Khel area of tehsil Miranshah, said Agency Headquarters Hospital Miranshah MS Dr Muhammad Sadiq, adding that 25 more people are admitted at the hospital. The outbreak of measles started in April across the Agency. Sadiq said that in the past week many patients have come from Darpa Khel and Madakhel because the localities have major sanitation problems. “We started vaccinating children but the disease resurfaced after a gap of one month,” he said, adding that most of the vaccines provided by the government have expired because of high temperatures and prolonged power outages. LITTLE ROCK, Arkansas (AP) - The Arkansas Health Department says three siblings have been diagnosed with suspected measles and unvaccinated students at a northwest Arkansas boarding school where two of them are students have been sent home. The increases in philosophic exemptions in Arkansas raise concerns that outbreaks of vaccine-preventable diseases may occur in the future. Outbreaks of vaccine preventable diseases in the United States are very much a "first world", leisure travel-associated problem and therefore, entirely preventable. Check your vaccination status before you travel abroad! A half-dozen families are suing the state Department of Health and Human Resources because they say the department is illegally requiring school children to receive certain vaccines. If successful, the lawsuit could block vaccination requirements for middle and high school students that are in effect this fall for the first time. The lawsuit was filed late last week with the state Supreme Court. The suit accuses DHHR of improperly adding vaccines to a list of state-mandated vaccines for public school students. Lane said the lawsuit is not about immunizations in general, but instead about DHHR overstepping its authority. He said DHHR is requiring the vaccine in a rule but that DHHR can't require vaccines without legislative approval. "I guess, on their own initiative, the agency has attempted to bypass the Legislature and, in our view, illegally add these other compulsory immunization requirements," Lane said. "And the rest of that is if parents do not comply with these additional requirements - the five additional - then their child cannot go to school in West Virginia." A recent rule change requires incoming seventh graders in the state to show proof they received one dose of meningitis, tetanus, diphtheria and pertussis vaccines starting in the 2012-2013 school year. Incoming high school seniors must prove they received booster doses after the age of 16. Without vaccination proof from before or shortly after the beginning of the school year, students cannot attend school, Associated Press reports. That is a booster of Tdap or TD if the child is pertussis exempt for medical reasons and a meningitis (MPSV4 or MCV4) vaccine series of two. I don't see how Mr. Lane claims it is five additional requirements. The Commissioner may, by Order filed with the Secretary of State, modify, add or delete vaccines to be required for new school enterers. The Commissioner’s Orders shall be made after consultation with the State Health Officer and shall be consistent with the immunization schedules referenced in section 3 of this rule. The Commissioner’s Orders shall not exceed those recommendations. In any event, it will be interesting to see what the ruling(s) on this suit will be. Listen to daddy, Bob, he knows what he is talking about here! Remind me - what does that other "M" stand for? Not enough children in the UK, especially those at middle/high school age, have full (i.e. 2x) MMR coverage, which has led to a slow and sustained measles outbreak across the UK (Just the Vax passim here and here). Now the MMR protects against three diseases, measles of course, but also mumps and rubella. The HPA North East has issued a health warning, since they have seen a 400% increase in mumps cases in April to June 2012 (133) over 32 in the same period of 2011. Almost half of these cases are in 15 to 24 year olds. While those may be un/under-vaccinated because of the MMR manufactuversy, a new "generation" of kids is unvaccinated against mumps because clinics offering single measles, mumps and rubella vaccines have been unable to source the mumps from anywhere for the last couple of years now. Worse yet, rubella cases have reached 57 in the first 6 months of the year, exceeding annual rubella case counts of the past 9 years. This is a typical pattern, where measles outbreaks happen, mumps and rubella are also occurring - a sure sign that 2xMMR prevents all three - go get your child (or yourself) caught up, if must be with MMR, even if mumps is the only shot they are missing. The U.S. is experiencing record numbers of West Nile Virus (WNV) this year. So far, 38 states have reported human cases, but the epicenter is Texas, which has reported half of the WNV infections. The CDC said so far it has received reports of 1,118 cases, including 629 people with the neuroinvasive form of the disease. Nationally, 41 deaths have been reported. West Nile virus has no vaccine and no cure and can cause permanent neurological sequelae or death in about 1 in 150 people infected. About 80% of those infected do not experience any symptoms but 20% will have moderate symptoms that mimic the flu and can last from days to weeks even in healthy people. Forty-seven states have detected West Nile Virus in either humans, birds or mosquitoes. You can navigate the maps to view the status of your area. It is imperative that people follow the guidelines for preventing WNV. In areas where standing water cannot be removed such as rainbarrels and ornamental ponds, use mosquito dunks to control larvae (this is not an endorsement of a specific product but rather an example). Mary Holland of the Elizabeth Birt Center for Autism Law and Advocacy (EBCALA) recently posted A Critical Review of the Performance of the Interagency Autism Coordinating Committee (IACC). Mary Holland's completely fallacious and misleading diatribe is rivalled only by her and her "colleagues" embarrassing display at the recent IACC meeting. Mary Holland is anti-vaccine to the core and no amount of her unctuous rhetoric can disguise that fact. Just the Vax is pleased to have a guest blogger, Robertson deconstruct Mary Holland's deceitful and self-serving castigation of the agency that has been tasked to recommend research avenues that would best serve all autists simply because vaccines explicitly do not predominate the IACC's recommendations. The critique starts out with a misrepresentation of the CAA (Public Law 109–416). No where in the text of the Act does it mention the word "epidemic". Sure, it mentions the need for epidemiological studies, but legislators recognized that there is a great need for research into autism, without invoking an "epidemic" to justify it. They also knew that there wasn't evidence to support the idea that there is an epidemic. ‘‘(C) at least one such member shall be a representative of leading research, advocacy, and service organizations for individuals with autism spectrum disorder. Note that the Law calls for public members to represent, in order, autists, parents and, last, at least one member as a representative of an organization. The default is that a member is not a member of an organization. Complaints that a member needs to represent an organization are red herrings. If one wishes for the committee to represent all views of causation, consider this: a study by the MIND Institute presented at IMFAR reported that 20% of parents believe that vaccines cause autism. The public members of IACC do represent this diversity, with the majority of parents not ascribing to this failed notion of a vaccine epidemic. First, one must note that this misrepresents the CDC autism prevalence estimates. They are not a declaration of the true, secular prevalence of autism. They are estimates based on the best efforts of a hard working team doing record reviews. The increase in autism prevalence represents children born before even the first IACC was formed in 2001. Much before the IACC as formed by the CAA. The "epidemic" has been shown to be largely due to quantifiable social factors, through research directly supported by an NIH Director's Pioneer Award. There is no reason to expect that the factors he identified and quantified are the only social factors at play in the rise of autism prevalence. In other words, there may be, and almost certainly are, more social factors which are behind the increase. Such research as Bearman's is a direct challenge to the notion of the "epidemic" as defined by Mary Holland, and it is disturbing (but expected) that she ignores these important results. Holland implies she knows what Congress's "original intention" is. She clearly thinks that this intention was to prove that the rise in prevalence is an epidemic caused by vaccines. There is no language of vaccines in the language of Public Law 109-416. This is not an oversight. Congress was well aware of the debate and chose to leave this language out of the Law. Appointment of committee representatives who subscribe to the same views as the majority of the scientific community, and of the majority of parents, is hardly "controversial". Positions held by Mary Holland, untenable positions of vaccines inducing an epidemic, those are controversial. The phrase "Troublesome history of committee members themselves" is nothing short of a thinly veiled personal attack on the members. It has not been established that this is a "less representative" panel. Much to the contrary, the science has progressed away from the idea of a "vaccine epidemic" and the public in general and the autism community in specific has moved away from this failed notion. At this point Holland moves into attacking those on the committee who do not share her minority viewpoint. A variety of philosophies is represented on the IACC. The IACC even includes people who still adhere to the failed notion of mercury causing an autism epidemic. Ms. Redwood is the one parent of a high functioning child serving. Parents of children with greater challenges are also represented. With roughly a half million (estimated) child autists in the U.S., representing "tens of thousands" of parents is representing a minority. Minorities should be represented, but should not dominate the process. As are many, many, other highly qualified candidates. Why should the views of autism parent community--or more specifically the minority fraction that Holland represents--be the standard by which the committee is formed? How does ascribing to the position supported by science, as the majority of those appointed to the IACC do, become "ideologically biased"? How does a committee which represents the fact that the vaccine-causation idea is a minority viewpoint be defined as "ideologically biased"? The answer is clear: the IACC is not the ideologically biased group in this discussion. It is worth being reminded that the text of the Law does not call for representation of the vaccine-causation viewpoint. In fact, the requirement for public members calls for autist representation and then a parent. Last is a member of a "leading" autism organization. Apparently, being an autist or the parent of an autist is not a qualification for being a representative on the IACC in Holland's view? What does it matter how Matt Carey is "best known" to Holland's minority community? Again, the CAA does not require members to represent an organization. Much to the contrary. What matter is there that Carey blogged under a pseudonym especially given that his identity is know well known. Carey's blog has multiple discussions of vaccine safety studies but apparently studies which show vaccines to not cause autism are not real vaccine safety studies to Holland. Ironically, Holland attacks Carey while claiming without any evidence that Carey attacks others. As a representative from Puerto Rico, Jose Cordero represents the interests of under represented populations. His service to the nation should be applauded, but such is her bias against the CDC that Holland sees this as a deficit. She attempts an ad hominem attack on Dr. Cordero, trying to link him to the manager of a research group whose financial activities came under question years after Dr. Cordero's tenure at the CDC. The work performed by researchers in Dr. Thorsen's team has been replicated by other groups and has not been called into question by others outside groups like those represented by Holland. James Ball represents an autism organization representing few families. Holland herself represents an autism organization representing few families, unless EBCALA has a much larger membership than is publicly presented. An In other words, this is a red herring. Dennis Choi is on the staff of the Simons Foundation, a research organization that is solely committed to a genetic causation model of autism; Choi was formerly an employee of the pharmaceutical giant Merck, one of the world’s top-three vaccine manufacturers. There is also concern about his level of commitment to serving on the IACC given a track record of poor attendance. Dennis Choi represents an organization which is the largest private supporter of autism in the world. The fact that Simons is willing to work with the IACC and share information should be applauded. Alison Singer is the mother of an affected child and a previous representative of Autism Speaks on IACC. She resigned from Autism Speaks regarding differences of opinion about vaccine research but was allowed to keep her IACC seat. She now serves as President of the Autism Science Foundation, an organization she started that is funded at least in part by vaccine makers. Seats on the IACC are given to individuals, not to organizations. As an attorney, Holland should be well aware of this as the language of the Act is quite clear. The ASF does not disclose donors publicly, and makes no mention of vaccine manufacturers offering support. More to the point, the ASF funds quality research. Holland is welcome to discuss what parts of that research program she finds objectionable. Idil Abdull is a mother of an affected child, represents no national organizations, and has promoted vaccination in concert with local public health officials. Again, when did being the parent of an autist become a drawback to service on the IACC? Why is holding the widely accepted view that vaccination is an effective public health measure a deficit? These are not deficits to the majority of Americans, or even the majority of the autism community. This is a group of red herrings. The Law requires that there be autist representation. By definition, autist public representatives will be "high functioning" to the point that their disability does not restrict them from participation. This represents the divisive attitude that Holland has towards adults and those who have challenges, but challenges of a different nature than those autists who also have intellectual disability. Dr. Batra's role in the autism community is providing medical services to autists and their families. This is admirable, so Holland ignores it. Again, the complaint about a national autism organization is a red herring. Dr. Mandell does not represent the Autism Science Foundation, as is made clear in the HHS announcement of new members (http://www.hhs.gov/news/press/2012pres/03/20120329a.html). But, this is a red herring as an organization could have multiple members. Holland didn't spend much effort to research what his goal is, but, rather, focuses on her own misconceptions. Astonishingly, even though significant evidence exists to show autism is an environmentally caused disease, no environmental scientist has been appointed. This seems not only illogical, but also highly irresponsible. It is hard to interpret the composition of the new IACC as anything but a stinging rebuke to those who believe autism is a treatable, medical condition with underlying environmental causes and who proposed qualified candidates to represent that view. It is even harder to believe any real progress will be made under the direction of the new committee members on the environmental triggers of autism. There is a strong interest in environmental research, just not the small corner that Holland is focused upon (vaccines). It is astonishing that Holland has not accepted the mountain of evidence that her own, very narrow focus, has little to no support in the science. The idea of vaccines causing an autism epidemic was never well supported and the primary hypotheses have been disproved. Another section of personal attacks. Holland, and others, appears to define "sense of urgency" as "accepting the failed notion that vaccines cause autism". As such we are left with the choice: a committee that meets her definition of working with a sense of urgency or a committee which adheres to evidence and science and is working diligently to making life better for autists and their families. Again, the MIND Institute's study points to the majority of parents having moved on from the vaccine causation hypothesis. Holland, as one of the authors of the PACE study, has ironically made a minor ethical lapse in failing to point out that she has a conflict of interest in promoting her own, flawed, research. By failing to inform the public of her own role, she appears to be less biased about the results than she is. "Despite this association" is a non sequitor. Mentioning her own PACE study does not create an association. Dr. Insel's brother helped to reduce infectious disease through an invention made decades before the first IACC was formed. Whatever patent has long since expired and the opportunity for financial gain is gone. Neither Dr. Tom Insel nor his brother stand to profit in any way from whatever outcome there may be from research into the autism-vaccine link. It is heavily ironic that a group purporting to support prevention research should be so critical of remarks by Dr. Insel about the possibility that a preventative method may some day exist. It also speaks to the question of whether these groups are "pro vaccine safety" or "anti vaccine" that the mere mention of a vaccine to prevent autism would be considered insulting. Dr. Insel did not rescind the committee's vote. He called for a new vote and the committee rescinded their vote. That's what a re-vote means. Vaccines are not mentioned in the Combating Autism Act. Also, there is no "strategic plan of the combating autism act". The strategic plan is a product of the IACC. Consider the history of the re-vote. It is known that one public member was in communication with her organization the day before discussing how to vote in the re-count. How is this a "surprise"? How, exactly, does apologizing on behalf of another member bring his fitness to serve into question? This is simply an attempted ad hominem attack on Dr. Insel. Again, the estimated autism rate for children born before the IACC was formed, has increased. Holland seems to wish for research to allow for the prevention of autism through time travel. Ironically, the primary evidence that Holland would use to support the idea that autism is largely environmental was funded under Dr. Insel's watch: the California Autism Twin Study. She wants to use research funded under his stewardship to attack him for not funding research valuable to her community. The IACC's Strategic Plan does call for a high level of environmental risk factor research. How well the plan is put into action is not within the control of the IACC. And here is where Holland is propagating yet another misconception: the IACC is an advisory committee. It does not fund research. It has no research budget. The strategic plan is set forth to advise government and private entities in the direction of research. The IACC can not require researchers to submit proposals, nor can it fund proposals which are not competitive. Once again, it is worth noting that Holland's viewpoints on vaccines, both as a possible risk factor and as the proposed primary focus of the IACC is a minority viewpoint. It is interesting that one very stretched attempt at declaring a member has a conflict of interest is inflated now into a "history" of "conflicts of interest". In this instance Holland is faced with "You get what you ask for". By focusing discussion on causation and recovery, she and her colleagues have created the atmosphere which has focused on the young. She and others have actively denied the existance of, much less advocated for support for, the autist adult population. Even in this critique, the only mention of adults focuses on the youth of today becoming adults. Not the adults of today. This is incredibly poor planning on the part of her generation of advocates. The IACC has called for more investment in environmental risk factor research. Holland has not been honest with her "tens of thousands" of parents by hiding this fact. Autism is more than claimed to be "highly heritable". It is highly heritable. It may not be as heritable as previously estimated, but it is still highly heritable. All genetics is not heritable, as evidenced by Down Syndrome. There is certainly accountability for public members who are stakeholders. To imply otherwise is dishonest and insulting. The future for themselves (autists) and their children (parents) will be partially defined by what they do. Holland's own experience shows this. She appears to be waking up to the fact that there is little support for adult autists. She and so many "advocates" have denied the existence of adult autists to the point that little work has been focused on them. It is unfortunate that so much time, money and effort was spent chasing MMR and thimerosal as possible risk factors. Rather than face another 10 years without progress, it is time we moved on. "not a single new case of autism was prevented". The IACC can't take responsibility for the Rubella vaccine, but it has been preventing autism for decades. Holland appears to have an aversion to acknowledging any benefit to vaccines, finding it insulting that a vaccine could have a benefit to the autism community. It would benefit the community if SafeMinds and other organizations made it clear that the IACC has called for a greater level of support for environmental causation. It is also worth repeating, the IACC is an advisory committee and does not have control over what project proposals are submitted or funded. If one uses as the yardstick providing evidence for the vaccine hypothesis, one will be disappointed with the progress made. Holland also implies in the above that the IACC has more power than it has. Again, it is an advisory committee and does not do research nor does it control any research budget. The idea that autism can be identified before age 1 is an important one. Since this runs counter to the idea that vaccines cause autism typically in the second year of life, it is not surprising that Holland doesn't give this result respect. Perhaps Holland could explain why it is mockable that one could start on early intervention as soon as possible. Holland appears to be ignorant of the importance of genetic results. And genetics in general. Understanding which genes are important and the role they play is very important. Perhaps the best progress made so far in treating autism is for those with fragile-X, a genetic condition. By focused effort in this area over 2 decades, potential treatments are being made available. Treatments which may hold promise for treating autism even in autists without fragile-X. Once again, it is difficult to answer such a sarcastic and demeaning response. However, the fact that autism risk is multifactorial is important. Holland seems to want to quash genetic research in much the same manner that she wrongly claims environmental causation research was quashed. Learning what doesn't work is important. The alternative medical community, supported by groups such as EBCALA, would be wise to learn this lesson. Holland could improve her argument if she were to point out where she, EBCALA or any of the groups promoting vaccine causation have stressed the need for services for adults in the last 10 years. Groups such as EBCALA groups have actively denied the existence of the adult autist population in order to promote the "epidemic". It is difficult to not note how insulting this comment is. Holland appears to have not read the report beyond the result that the autism prevalence is about 1% in adults. Adult autists are under employed and unemployed. Adult autists live alone. Adult autists are unidentified and unsupported. That this translates to "everything should be fine" is ignorant and insulting and demonstrates the contempt she and her organizations have shown for the needs of the adult autist population. Does Holland disagree with the idea that we need more studies, more early detection and more services? The section title is "what...needs to be met". Are we supposed to say, "no needs. We have all the infrastructure and surveillance needs met". Holland's comment is sarcastic and demeaning. We learn that most medications don’t work. That therapy only works if the teacher is good. That social goals should be set for affected children. That there are no services for adults. That there is an increase in ASD, but there’s not an increase in ASD. And that pediatricians should be on the lookout for autism by one year of age. The monumental waste of time, money, resources, and effort that went into confirming, or confusing, that which could have been identified through common sense and daily life is stunning. None of these studies did anything to advance the quality of life for those affected by autism and their families. We can and must do better immediately. To summarize, after a decade of actively working against improving the lives of adult autists, a decade focused on a single goal (vaccine causation), a decade of wasted effort, Holland, EBCALA and other organizations are now trying to shift the blame on to others for their own mistakes. Autism is a disability. Any rate of autism is a need for concern especially when our society does not properly support this population. This is just typical political rhetoric. Calling autism a "national health emergency" does nothing. Action, not words are needed. Action such as learning from the mistakes of Holland and like minded individuals who spent too much time chasing an idea which had little support from the beginning and now is clearly false. We, the majority, also expect accountability. We expect that those who have driven the public discussion on autism into fruitless areas like vaccine causation should step aside and allow people of action and good ideas to step in. Thankfully the government appears to have heard this plea. The fact that the same few autism groups can continually make new organizations (canary party, FOCUS autism, etc.) and make unsubstantiated claims of broad support doesn't make for progress. Here Holland does one of her most ironic steps: she uses recent results (the California Autism Twin Study) while claiming that no good results have come forth in autism research. She denies the strong heritable component demonstrated in the CATS, effectively saying that the risk factors for about 1/2 of the autist population are unimportant and should be ignored. What does this have to do with autism? Answer: nothing. The medical reason for this intervention is that it works. Hepatitis B infection rates are dropping in the US with the implementation of childhood vaccination. Holland ignores the very real risks to infants from Hepatitis B infection, which include chronic infection which leads to serious complications and death. Waiting for puberty for this vaccination would put a great deal of people at risk. Holland feels that her own study is much stronger than it actually is. Having made one weak attempt to claim a conflict of interest in the IACC, she now moves for a congressional inquiry into COI's in all federal activity? Holland has cherry picked a quote out of the proper context. Insel was speaking to the idea of better diagnosis. He can be found here discussing the effects of diagnostic changes and changes in ascertainment. From this she further puts words in his mouth. Insel's comment in the very interview Holland is referring to is "As far as I can tell, the burden of proof is upon anybody who feels that there is NOT a real increase here in the number of kids affected" A strong statement but not an "admission that autism is absolutely on the rise". Holland makes the common mistake of misrepresenting incidence. We don't have true incidence data in the U.S. or elsewhere. We have prevalence estimates. Estimates which are acknowledged to be likely undercounting autists in our population. A series of underestimates, even if the estimates are going up, is not the same thing as an increase in the actual number of autists. A large fraction, perhaps the largest fraction, of our "most vulnerable population" are adult autists. Holland may not have seen them before, but they are most definitely here. Her denial of their existence has resulted in a delay in understanding the needs of this population. Truly a moral failing in the service of a political goal: the acknowedgement of a "vaccine epidemic" in spite of evidence to the contrary. We must chose our organizational leaders the same way. Which is why the majority of autists and parents are not members of the groups that Holland is allied with. Sadly, she ends with the same sentiments that have gotten us into such trouble: the feeling that autism is only about children. Adult autists just don't seem to exist in her world view. People, autists or not, children or not, deserve nothing less than an abandonment of the type of leadership Mary Holland has provided. On 3 August 2012, the Florida Board of Medicine decided (according to their preliminary minutes, full decision to be linked when it is published now added) that Mark Robin Geier is: to pay a $1000 dollar fine, the costs of the procedure, and not to practice in Florida until he petitions for reinstatement and appears before the Probation Committee. This follows a previous complaint by the Florida Dept of Health which Todd W. explained back in March. 21 experience, or licensure to perform them. I must admit a certain amount of relief at the sight of the "suspended" watermarks behind Mark Geier's license on the Florida Dept of Health's Practitioner Profile. It means that children in one more State are safe from unproven autism "therapies". ETA: Todd W. has a description of the Florida proceedings and updates from Indiana and Maryland. Last week Angola announced there were no new cases of polio since July 2011. LAUNDA, 10 August, 2012 – Today, Angola marks a year without a new wild poliovirus case, moving the world a step closer to the final global goal of eradicating this contagious crippling disease forever. After a concerted effort to stop polio transmission the number of polio cases dropped from 33 in 2010 to five in 2011 and no cases registered in 2012. Laboratory results have confirmed that the last case of wild poliovirus was a 14-month-old child from Uige Province in the country's Northwest in July 2011. This marks a victory for the polio eradication initiative as Angola experienced a resurgence of polio in the last 6 years. Angola, which eliminated polio from 2001 to 2004, has been plagued by the re-emergence of this crippling disease since May 2005. The disease has since spread from Angola to Namibia (2006), the Democratic Republic of Congo (2006, 2008 and 2010), and the Republic of Congo (2010). Religious opposition and the U.S. CIA's use of a sham vaccine campaign have caused setbacks in some African and Middle East countries. However UNICEF is working closely with religious leaders, particularly in Pakistan which has recorded one of the highest number of polio cases in the world. Several other countries have no polio cases on record thus far for 2012 making only four countries recording polio cases for this year, Afganistan, Nigeria, Pakistan and Chad. This is good news for global vaccine efforts and the eradication of polio in sight. the new CDC recommendations are out - have a read. The CDC also provides detailed considerations on vaccine doses for children under 8 and adverse effects. Note: due to the recent amount of waffling trolls on this board, only genuine questions regarding flu vaccine, schedule etc. will be tolerated in this thread. Rather small-mindedly, the organisers turned down Scotty's generous offer of coming back for the next seminar the next day to provide some balance. Pwned - just beautiful - cheers mate! I cannot believe that the first Christmas chocolate selection boxes have already made it into some stores. That means Christmas must be imminent, right? I guess any month is a good month to think of gifts, so let me advertise this fabulous idea (for which I am not getting any commission or anything, I just want to share the thrill of saving lives - feel free to donate any other way you see fit). Sussex county, United Kingdom now has 314 confirmed measles cases second to Merseyside's 414 confirmed cases. Sussex has more cases of measles than any county in the nation other than Merseyside. Brighton and Hove experienced 186 reported cases this year while East Sussex has 88 cases and West Sussex has 40 cases. Through all of 2011, the county reported 173 cases, the Argus reports. The increase in cases is due to still insufficient measles vaccine rates. This brings the total number of UK cases to over 1279 for 2012. The EU has reported over 18,000 cases of measles for 2012. The world is full of people willing to take advantage of the desperation of parents of "sick" children. One prime example of this are the team of father (Dr. Mark) and son (David) Geier, who are peddling their own "autism treatment". In short, their hypothesis is that testosterone in the body interacts with mercury from thimerosal-containing vaccines, retaining this in the body, which somehow causes autism. Sounds crazy? Not crazy enough apparently to discourage parents from choosing to visit Dr Geier's clinic and getting their children treated with a strong drug, Lupron (also used for chemical castration) to "get rid" of the testosterone and subsequently making the mercury accessible to "chelation". You can read Kathleen Seidel's excellent summaries of the Geiers' undertakings, their misrepresentation of the science, and their financial interests here. Essentially, the weird testosterone-mercury hypothesis became a money printing machine. Children would come to the clinic, scores of blood tests would be ordered from "special labs" that would come back with the "right" diagnosis for billing purposes. "Precocious puberty" would be diagnosed and Lupron prescribed (which would then be billed to insurance companies). Apparently, David Geier, who holds a BA in Biology, was seeing patients and advising parents in his father's clinic. Many people have been thinking for years that father and son Geier should be in prison for their abuse of autistic children, their exploitation of the parents seeking their help and their health insurance companies. Complaints were made to the various State Medical Boards where Mark Geier held licenses and, one after the other, very slowly, those were removed - Todd W is keeping tab. Now, finally, David Geier has been convicted of "Practicing medicine without a license" by the Maryland State Board of Physicians and ordered to pay US$ 10.000 (being let off very lightly IMHO). Read the whole ruling if you have the time. The audacity is amazing (the spelling mistakes in the "diagnosis" written up by David Geier are priceless, but he charged parent A "only" $150 for it). Thanks are due to "parent A", who remained vigilant and filed a complaint when she saw the inconsistencies in the treatment of her son and the billing documents. Mythical Claim: Hepatitis B is a sexually or IV drug transmitted disease. Fact: Hepatitis B is not just a sexually or IV drug transmitted disease. It is the primary mode of transmission in industrialised countries, like the U.S. but in others, vertical transmission i.e. from mother to newborn during birth is the most prevalent mode of transmission and worldwide, accounts for 40-50% of hepatitis b infections. Hepatitis B virus is spread via infected blood or bodily fluids through breaks in the skin and mucosa. Additionally, hepatitis b virus can remain infectious on inanimate objects such as razors and surfaces for a week. Prior to 1991 in the U.S. it has been estimated that 16,000 children under the age of ten years old were infected each year through contact with HBsAg-positive family/household members and outside contacts. Also during that time, 30-40% of adults infected had no risk factors which implies more casual contact with infected people and/or fomites with hepatitis b virus contamination. Mythical Claim: Most people who get hepatitis B virus clear it. Fact: Most adults who become infected with hepatitis b are able to clear the virus, however it is estimated that 17.5% of those who acquire hepatitis b remain infected and become lifelong carriers. About 25% of carriers who experience acute clinical illness die of cirrhosis or primary liver cancer. The younger the age at infection, the greater the risk of becoming a chronic, lifelong carrier is. Seventy to ninety percent of infants born to HBeAg positive mothers and don't receive immunoprophlaxis (hepatitis b vaccination and immunoglobulin) will become chronically-infected by the age of six months old. Mythical Claim: I don't need to get tested for hepatitis b when I'm pregnant. Fact: The recommendation is for all pregnant woman to get tested for hepatitis b surface antigen (HbsAg). It is crucial that you know what your test results are and what they mean. The tests used are not 100% accurate but do have excellent specificity and sensitivity. Anyone in the household or other close contacts should also be tested. If using a midwife, please be sure that hepatitis b testing is done. Mythical Claim: Other countries don't give a birth dose of hepatitis b vaccine. The U.S. shouldn't be giving newborns a vaccination. Fact: Other countries do administer a birth dose of hepatitis b vaccine: Bulgaria, Croatia, Estonia, Germany and Latvia (if mother is HbsAg positive or unknown status), Poland, Portugal, Romania, Spain and Turkey. This is just the EU. Some factors to consider when trying to compare the U.S. to other countries that don't vaccinate for hepatitis b is healthcare systems, epidemiology of the disease and immigration. The U.S.doesn't have universal healthcare as do many EU countries which means that many hepatitis b infected pregnant women and their contacts fall through the cracks and don't know their hepatitis b status. The U.S. has a high rate of immigration and visitors from countries with high endemicity of hepatitis b. Although the UK is experiencing an increasing rate of hepatitis b-infected pregnant women who have emigrated from other countries. During the period of 1990 to 2004, the incidence of hepatitis b infection declined in children 19 years and younger by 94% when the hepatitis b series starting from birth was implemented. This didn't happen by magic. Hepatitis b infection in newborns carries an extremely high risk of chronic infection and complications of fulminant liver disease. There is no guarantee that teenagers who become sexually-active and become infected will clear the virus and not also become chronic carriers, not even your beliefs in a "superior" lifestyle. Please base your decisions on facts and not fictitious claims meant to incite fear, uncertainty and doubt. The Best Anti-Vaccine Comment Ever! We recently got an anonymous commentor on the Sue Reid propagates MMR Manufactuversy in the Daily Mail post. She, by far, represents everything that is so wrong with anti-vaxx dogma and offers a chilling glimpse into the tortured, erratic, absurd and obtuse mind that latches onto vaccine disinformation. my son survived because a life saving surgery to fix his colon has been introduced. 50 years ago, he would not have survived! Now let me ask you this about your child's medical procedure. Did you demand studies from the surgeons that the procedure had been submitted to controlled trials for several years before being performed on your child? Why not? Did you demand studies from the surgeons that the procedure had been submitted to controlled trials for several years before being performed on your child? Why not? Where have I ever led you to believe that I rely on scientific research to make my decisions. My son needed a life saving surgery, and because of advancements in science, he is here today, taking a direct hand in decreasing infant mortality. stop giving credit to your vaccines! For you gals WHO need so called research to think for yourselves...Where is the solid evidence that babies, who get more than two-dozen doses of vaccines by age six months, are healthier as they grow up than those, who get fewer vaccines or no vaccines? No large, prospective studies have been done comparing the long-term health outcomes of children, who are vaccinated according to the CDC schedule, with those, who are not. I will again take my awesome intuition leading me to think for myself over your "research" conducted by the giant pharmaceuticals, coupled with law makers that are recipients of the deep pockets of these companies. they are the ones who use fear mongering tactics to sell more and more vaccines. Stop accusing Sue Reid and let her write about our debated topic here.. don't you see the conflict of interest with all your "research"? well here in America, we are progressively challenging the bloated and expensive vaccine schedule and are telling doctors and legislators: "Show Us the Science, and Give Us the Choice." yes i took this from an anti vaccine website -- so what, get over it. Your children may be healthy now, but you will never know how healthy they could be without all the toxins you are giving them. you Gals, have yet to answer my looming question - what is your explanation (don't care if it is scientific or not) of the growing number of neurological and other disorders? please..I would really love to know?? If your child or (someone you know), suddenly develops lupus, rheumatoid arthritis, or any other auto immune disorders later in life.. you may consider you lended a hand by inundating them with toxins. so we are clear about the toxins: (to name a few) There is aluminum in Hep B... There are also trace or residual amounts of 2-phenoxyethanol, phenol, albumin, sucrose, lactose, MSG, glycine, formaldehyde, and antibiotics (neomycin) in vaccines. These are very small amounts, but do we want to continually inject even small amounts of these toxins directly into our tiny babies’ developing bodies, given their inability to detoxify and how vulnerable they are to low levels of toxins? If trace amounts of formaldehyde, MSG, or antibiotics were in foods that were to be given to our babies, most of us wouldn’t allow it. Yet, these toxins go directly into the baby’s bloodstream. Vaccines also can contain egg and yeast proteins. We delay giving our babies solid foods, mostly to avoid the proteins that can cause allergies. Why would we inject isolated proteins into their bodies at 2 months old? Please understand, I am not in favor of any shots... so please stop criticizing my debate, saying i am not posting to the right blog or what does this have to do with MMR or whatever. I am speaking out against them all. "Where have I ever led you to believe that I rely on scientific research to make my decisions." "For you gals WHO need so called research to think for yourselves..."
"I will again take my awesome intuition leading me to think for myself over your "research" conducted by the giant pharmaceuticals, coupled with law makers that are recipients of the deep pockets of these companies." I have no good answers to combat this and I am left to continue to speculate on the state of education in the United States that people such as Anonymous can find their way onto the internets and make comments like this in earnest. Regardless, it is cathartic to achieve this realisation and I will continue to pillory and counter anti-vaccine disinformation as long as I care to. H3N2 The New Swine Flu? Blogust 2012: be opinionated - save a life!